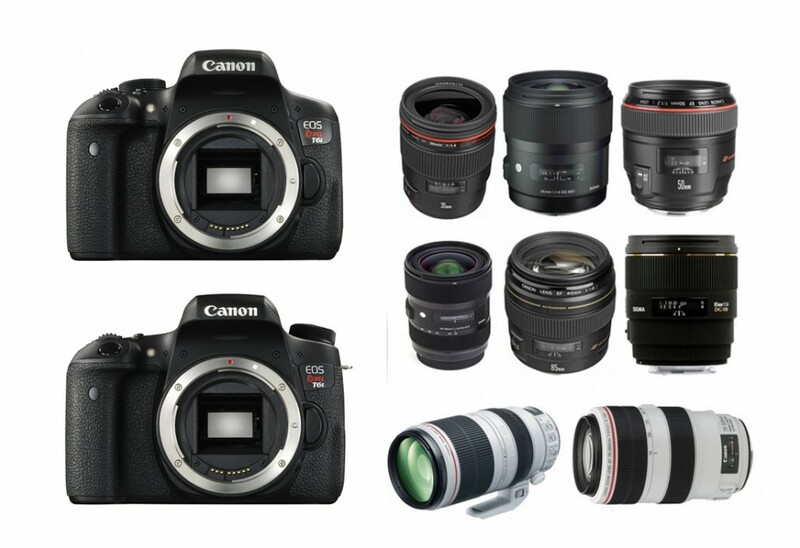 Canon EOS 750D/ Rebel T6i and EOS 760D/Rebel T6s were announced on Feb 6th, 2015. They use the same 24.2MP APS-C sensor and offer a new Hybrid CMOS AF III system for improved focusing. Below are a lot of recommended lenses for Canon EOS Rebel T6i /T6s. From the list , you can see, the Sigma 18-35mm F1.8 DC HSM A is the best wide-angle zoom lens for Canon EOS T6i / T6s, and the Sigma 35mm F1.4 DG HSM A is the best wide-angle Prime lens. The new released Sigma 24mm F1.4 DG HSM | A Lens ($849) is another best lens. The Sigma 50mm f/1.4 DG HSM Art lens is the best standard lens for Canon EOS Rebel T6i/T6s. The Canon EF 50mm f/1.4 USM , Sigma 50mm f/1.4 and Zeiss Makro-Planar T 50mm f/2 ZE are another three best lenses. You can also choose the cheapest Canon EF 50mm f/1.8 II lens for only $115. The best telephoto lenses for Canon EOS Rebel T6i /T6s is Carl Zeiss Apo Planar T* Otus 85mm F1.4 ZE lens, but it is very expensive. You can also buy cheaper lenses, such as Sigma 85mm F1.4 EX DG HSM Canon, Canon EF 100mm f/2 USM and Samyang 85mm f/1.4 Aspherique IF at affordable price. The brand new Samyang / Rokinon 135mm f/2.0 ED UMC Lens is another best choise. A super telephoto lens for Canon EOS Rebel T6i/T6s is very useful, but it is usually very expensive. The new released Canon 100-400mm f/4.5-5.6L IS II USM Lens is the best lens in this range thanks to its price at $2,199. You can also buy Canon EF 200mm f/2.8L II USM lens for your Canon EOS Rebel T6i/T6s. This entry was posted in Best Lenses for Canon and tagged best lens, Best lenses for Canon EOS T6i/s on November 9, 2015 by admin.